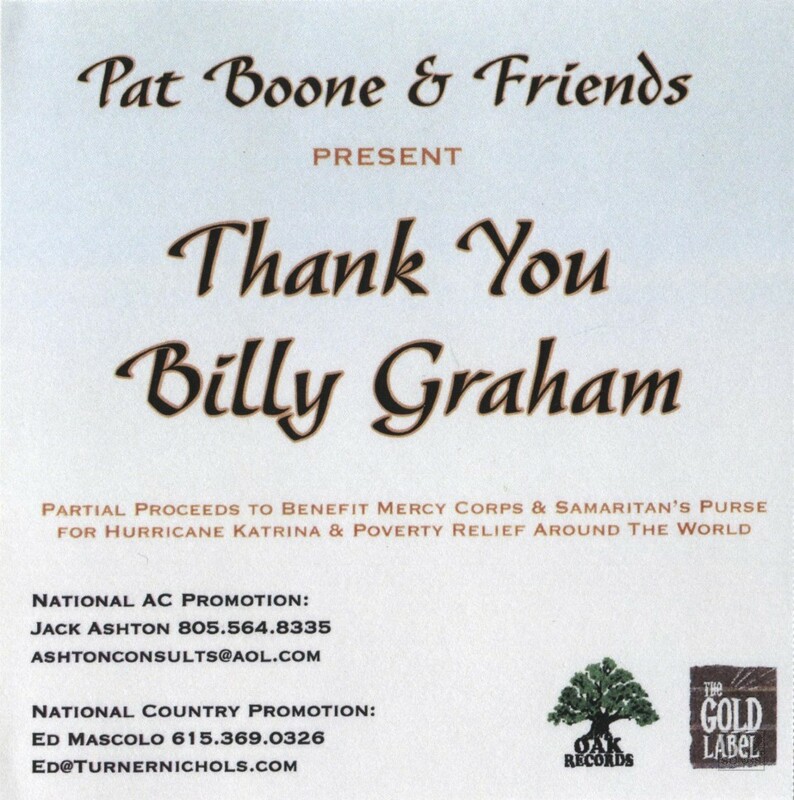 Perhaps one of the odder releases that features Bono or U2, this 2005 promotional single by Pat Boone featured the song titled “Thank You Billy Graham” which was advertised as an all-star tribute to preacher Billy Graham and taken from the album “Glory Train: The Lost Sessions”. And although he doesn’t participate in the song itself, the full version of the song opens with Bono speaking about Billy Graham as a lead in to the song. The opening sounds echoey for a reason, it was recorded outside of a studio. Bono appears in a video for the track and it appears he is sitting in someone’s home, near the water with birds flying by in the background. The remainder of the video shows the artists performing in split screen with photographs of Billy Graham throughout his career. Promotional copies of the song were also sent for promotion and featured the full version of the song, as well as a shortened “Radio Edit” which removed the introduction by Bono. This promotional CD came with a second disc which featured the video for the song in DVD format. Proceeds from the song and video were used to benefit Mercy Corps and the Samaritan’s Purse for Hurricane Katrina and Global Poverty Relief. Boone was interviewed about the song and Bono’s involvement. Boone had recruited Bono at a Grammy after-party following U2’s wins at the 2001 Grammys. “ “I came up behind him and said, ‘I think it’s time Boone-o met Bono,’” Boone says. “And he said, ‘We met before. Our group was just getting started and you were on tour in England. We were introduced to you, and you were very nice and encouraging. It meant a great deal to us, but I don’t expect you to remember it.’ Honestly, I did not remember — but nobody knew his group at that time. When I asked if he’d be willing to participate in the Billy Graham tribute, he said in a flash, ‘I will. I admire him greatly.’” said Boone.